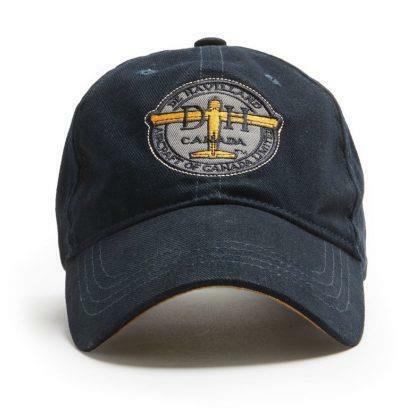 Clothing:Hats 23629 https://www.warplane.com/images/Products/23629.jpg De Havilland Aircraft of Canada: Founded in 1928, de Havilland Canada became one of the world’s great aircraft manufacturers. Starting out assembling British made Moth* Airplanes which made flying accessible and popular in Canada – the company went on to design and produce bush utility, military and commuter aircraft. Their most famous designs include the Chipmunk,* Beaver,* Otter,* Twin Otter,* Caribou,* Buffalo,* Dash 7,* and Dash 8* Airplanes. DHC coined the term STOL (Short Take Off and Landing) which was the most important capability of many of their designs. DHC was absorbed but lives on in the great Canadian company, Bombardier. Description: De Havilland Aircraft of Canada: Founded in 1928, de Havilland Canada became one of the world’s great aircraft manufacturers. Starting out assembling British made Moth* Airplanes which made flying accessible and popular in Canada – the company went on to design and produce bush utility, military and commuter aircraft. Their most famous designs include the Chipmunk,* Beaver,* Otter,* Twin Otter,* Caribou,* Buffalo,* Dash 7,* and Dash 8* Airplanes. DHC coined the term STOL (Short Take Off and Landing) which was the most important capability of many of their designs. DHC was absorbed but lives on in the great Canadian company, Bombardier.